Excuding an aged European charm, this 76 room property centered around a swimming pool and bar is located 2 minutes by car and 15 minutes by car from Knutsford Boulevard which is the main road through New Kingston. .The Four Seasons Hotel was once a private home and has been converted from one of the Kingston's fine Edwardian homes providing accommodation to the area. Securely nestled behind high walls. there is a quietness that is derived from such security and a special rural condition created with the presence of fruit and blossom bearing trees. Hotel is close to all activities including an 18 hole golf course. 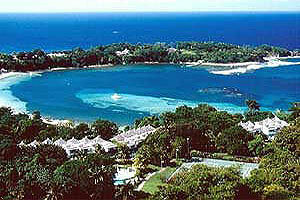 This small hotel popular with international airline crew and Jamaicas alike. Its one of the view small hotels to be found in the New Kingston area. It is important to note that this property is not a part of the Four Season chain but is locally owned and manage.